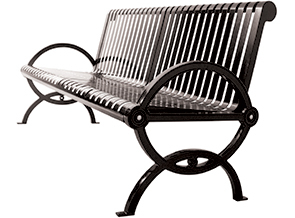 Vertical slat park benches from the Durham Collection combine appeal and practicality to create distinguished seating. These all-weather benches feature stylish elliptical arms and popular vertical slat bench seat assembly with rolled-edge design. 4' Bench - 51"L x 30-5/16"W x 37-9/16"
6' Bench - 75"L x 30-5/16"W x 37-9/16"